Also in April 23th April 23, all at 13º cardinal signs will form The Cardinal Grand Cross.The Grand Cross stays within orb until May 1, overlapping the Solar Eclipse at 8º Taurus on April 29. It will fall on Hamal, the flaming hot star in the Ram. The Solar Eclipse will sextile Neptune and square Black Moon Lilith making a nice mystical learning triangle. April 29 - New Moon. The Moon will be directly between the Earth and the Sun and will not be visible from Earth. This phase occurs at 06:14 UTC. This is the best time of the month to observe faint objects such as galaxies and star clusters because there is no moonlight to interfere. April 29 - Annular Solar Eclipse. An annular solar eclipse occurs when the Moon is too far away from the Earth to completely cover the Sun. This results in a ring of light around the darkened Moon. The Sun's corona is not visible during an annular eclipse. The path of the eclipse will begin off the coast of South Africa and move across Antarctica and into the east coast of Australia. (NASA Map and Eclipse Information). May 5, 6 - Eta Aquarids Meteor Shower. The Eta Aquarids is an above average shower, capable of producing up to 60 meteors per hour at its peak. Most of the activity is seen in the Southern Hemisphere. 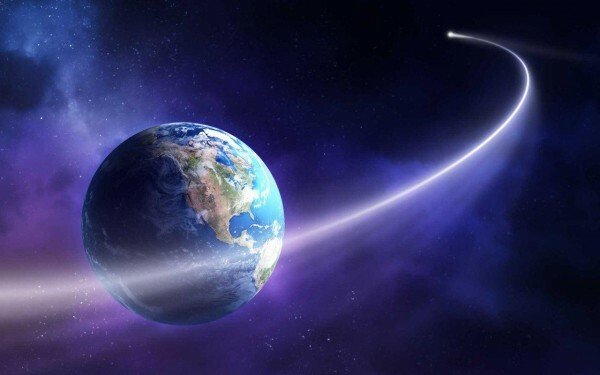 In the Northern Hemisphere, the rate can reach about 30 meteors per hour. It is produced by dust particles left behind by comet Halley, which has known and observed since ancient times. The shower runs annually from April 19 to May 28. It peaks this year on the night of May 5 and the morning of the May 6. The first quarter moon will set just after midnight leaving fairly dark skies for what should be a good show. Best viewing will be from a dark location after midnight. Meteors will radiate from the constellation Aquarius, but can appear anywhere in the sky.